The Adams family came to Missouri from Wilkes County, NC, in 1834 and began buying land in the area known as Bristle Ridge. This particular 80 acre tract was bought by Daniel Adams in 1844. During the Civil War, the Adams family were Unionist and many members, including John A. Adams (who built Cedarcroft), served in various State Militia units. After the war, John A. Adams married Dorothea Mack from a neighboring farm - his father gave him 40 acres and he built the house and two barns. John and Dorothea had 10 children (5 boys, 5 girls) and expanded John's land to 240 acres over the years. 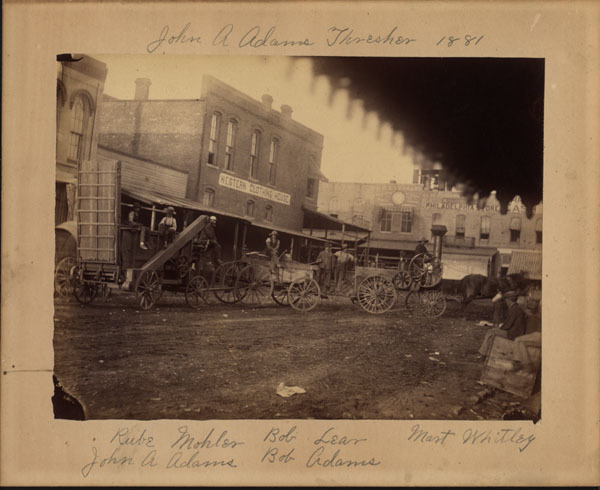 John bought the first steam thresher in Johnson County in 1881 (see the picture of it below). John A. Adams was a pioneer soil conservationist. He placed one of the first underground drainage tile systems in Missouri; then, he tied in the tiles with a series of cross-gully dams that effectively filled in the gullies and restored the contour of the land. This approach is essentially what is used today in terrace and tile systems on many farms. This pioneering effort has been recognized by naming Cedarcroft to the National Register of Historic Places as The John A. Adams Farmstead Historic District. When John A. Adams died in 1921, his youngest son, Elmer, ended up with the farmhouse and 120 acres. By 1934, he was in financial difficulties and sold the current 80 acres to the neighbors, Ben and Cora Herd. The Herds raised a family here, but Cora, by now widowed, needed to sell the farm in the early 1980s. At that time, Bill & Sandra were stationed in Cleveland, Ohio. We bought the farm in 1981; in 1986 Bill retired from the USAF and moved back to begin restoration. At this time, the farmhouse had no running water and only four electric circuits on a 60 amp fuse box. 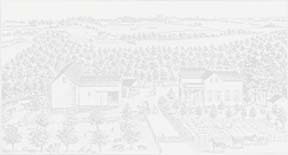 After extensive restoration, we opened Cedarcroft Farm Bed and Breakfast in 1988 under the name John A. Adams Homestead Bed & Breakfast Farm; when the name Cedarcroft was discovered on an old plat map, we restored the farm to the name John A. Adams gave it. In 1998, we constructed the Cottage on the Knoll on a small sandstone rise in the southwest 20. The area near the edge of the knoll had been quarried for foundations and a hand-dug well always contains water. During construction, we recovered several pieces of the original tile system. We closed the Farmhouse part of the B&:B in 2002 and the Cottage onthe Knoll in 2016. We now live in the Farmhouse and the new modern addition, and use the Cottage for a library and personal guest house.